Recently honoured with the Best Mobile Accessories Company in Ghana at the 2015 Ghana Information Technology & Telecom Awards and a feature on the Joy Business Van, Pisen Ghana’s smart and outstanding 4 co-founders will be taking turn on the Startup Dialogue to share their story, journey so far and lessons they have learnt in building a globally competitive business from Ghana. The dialogue which will be hosted at the TANOE Hub in Dansoman on 30th June, 2016 will have co-founders, Daniel Kwame Osafo, Leslie Okyere, Nii Lantei Mills and Joseph Gyamerah-Ako hosted by the CEO of The African Network of Entrepreneurs, Ekow Mensah and give the participants the opportunity to learn about franchise businesses and how to take advantage of the business opportunities PISEN Ghana presents. 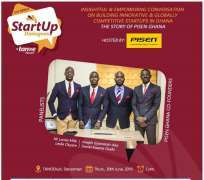 Themed “Building an Innovative & Globally Competitive Startup in Ghana, the PISEN Story”, the Startup Dialogues is an initiative aimed at encouraging insightful, engaging and empowering conversation amongst startup support stakeholders, policy makers, startups and successful entrepreneurs. It is designed to provide the relevant and adequate information, guidance and resources needed by startup entrepreneurs to be able to build innovative, sustainable and globally competitive businesses. Previous Editions have been held at Ispace Foundation in Accra and Kumasi Hive in Kumasi with the third edition to be held at TANOE Hub, Dansoman. The Startup Dialogues powered by The Startup Network & The African Network of Entrepreneurs (TANOE) and supported by Joy Business, Busy, The Help Station, Avance Media and IConceptsPR is held monthly and hosted by different Startup Ecosystem Stakeholder each month with enlightened and engaging panellist. For more information contact TANOE on [email protected], 0244512528 and 0242307379 or visit www.thestartupnetwork.org.